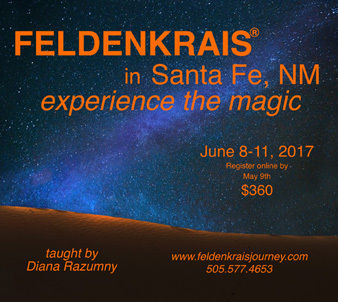 These 11 Awareness Through Movement® lessons were taught live in a 4-day workshop entitled Experience the Magic of the Feldenkrais Method® taught by Diana Razumny in Santa Fe NM in June of 2017. This lesson series (and the discourse not recorded) helped participants appreciate the magical qualities of learning and improving human movement. The movement theme of twisting was explored through a wide variety of lessons including classics from the Awareness Through Movement® book by Dr. Feldenkrais and those less traveled from the body of work Dr Feldenkrais taught in Tel Aviv on Alexander Yanai Street.